Dr Ian Oppermann is with Australia’s national science agency, CSIRO, as Foundation Director of the newly established Digital Productivity and Services Flagship. Flagships are CSIRO’s response to National Challenges and the focus of the new $41m annual Flagship is frontier service creation in the Digital Economy. With overall responsibility for strategy, direction and impact of the Flagship, the Director role is one of the Senior Management positions within CSIRO. 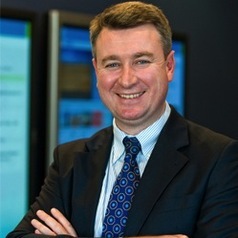 Until July 2012, Ian was Director of CSIRO’s ICT Centre. The ICT Centre is a business unit within CSIRO addressing major scientific challenges in Wireless Communications, Robotics, Information Theory, environmental sensing and eHealth. From 2007-’10, Ian was global head of Sales Partnering for Nokia Siemens Networks’ software business, and was (2005-’07) Director of Radio Access Performance Business at Nokia. Prior to joining Nokia, Ian was director of the Centre for Wireless Communications, a research centre in Finland. Ian has contributed to 6 books as editor or chapter author, authored or co-authored approximately 30 journal and 90 conference papers. Ian has a Doctor of Philosophy in electrical engineering from Sydney University and an MBA from the University of London. Ian is a Fellow of the Institute of Engineers Australia, a Fellow of the IEEE, a Senior Member of the Australian Computer Society, and a member of the Australian Institute of Company Directors. University of Sydney, PhD/Electric Engineering in Mobile Comm.